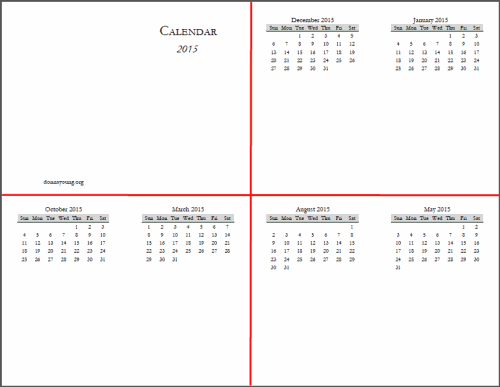 This calendar prints on both sides of one sheet of paper. 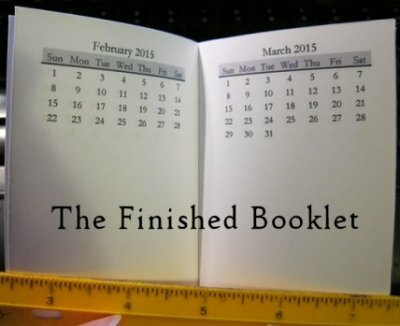 After the paper is cut and assembled, you will have a booklet that is a purse-sized calendar. You will need one sheet of paper. Use 24 lb paper or heavier. Important - **Do not use a duplex setting because that setting might print page 2 upside-down. **If you would rather use the printer's duplex setting, be sure to set the orientation to Landscape after choosing duplex. This should cause the paper to "flip" correctly. If you are not sure of the results, print a test copy first. Please don't ask me how to properly re-load paper into your printer. Thanks. Then cut those pieces in half - this would technically be crosswise. After cutting the paper, you will have 4 pieces of paper. Below are instructions for stacking the papers. Find the title page and fold it in half with the title facing outward. Unfold the title page - This makes a crease for the staples. Find MAY. Set the paper with the month of May on your table so that May is on top and right side up. Find MARCH. Set the paper with the month of March on top of May and right side up. Find JANUARY. Set the paper with the month of January on top of March and right side up. Set the title page, right side up, on top of January. Feel free to thumb through the stack to make sure the months are in order. Staple the booklet on the crease that you made in step one. Or sew along the crease. 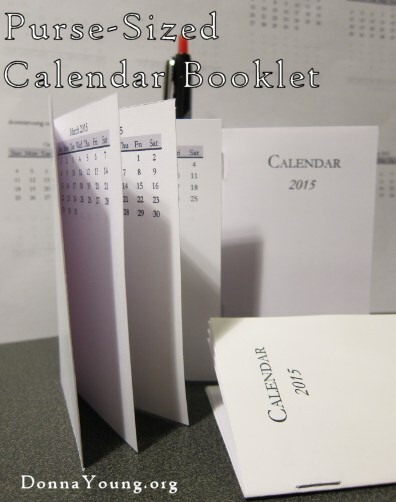 Availability of this calendar: This calendar's update date has not yet been established; however, this calendar is a one-year-at-a-time calendar. This file requires a YoungMinds subscription to print.